← Wendy’s World: Shaping Our Lives? At the start of the summer, I promised I would make a post about “what studying abroad in Spain has taught me about balance and stress and being perfectly imperfect,” and that blog post never materialized. I’m sorry about that, but since my first day of classes for senior year starts tomorrow, it’s as good a time as any to remember what I learned last semester and think about how I can apply it this fall to make my senior year great! So here are some things I learned about being perfectly imperfect while in Spain. 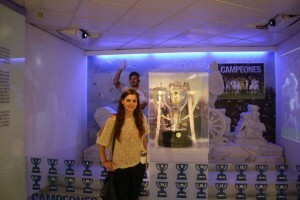 When I was in Madrid, I asked someone in Spanish to take my picture with the La Liga fútbol (soccer) trophy. I still feel a little nervous starting conversations, but the boy who took my picture said my Spanish was quite good! Being confident is absolutely the most important. You know that saying “fake it until you make it”? I definitely found that to be true while I was studying in Spain. For my first few weeks, I was super nervous about talking in class or to my host mother—what if I said the wrong word or my sentence was grammatically incorrect? As a writer and a journalism major, I definitely felt out of my element being uncertain if I could communicate. Then I realized that I would never learn if I was too nervous to try. I started speaking in Spanish to everyone—not just to people like my host mother who barely spoke English, but to my friends and professors and people I met in the street. I was still nervous, especially when speaking to someone who might not realize immediately that I was still learning the language, but it helped me improve my language skills so much. Now that I’m back in Ithaca, I’m going to strive to be confident about learning during my senior year. I’m not going to be afraid of trying something I feel uncertain about, and I’m going to take the initiative to learn more about things that interest me, even if I don’t know anything about them going in. Finding work/life balance is something I thought a lot about while I was in Sevilla. I took 16 credits while I was abroad, whereas many of the students in the program only took 12, so I had a lot of work: reading books, writing essays, and of course all of it was in Spanish. It would have been easy to stay inside all the time in order to study and do homework. At the same time, I was in Spain, where I had the chance to see the Spanish culture as well as travel to other places in Europe, so it would have been just as easy to put off my work in favour of having fun. Sometimes I combined classwork and fun! The Alhambra in Granada is very significant in Spanish religious and political history, which was the topic of one of my classes. I think it was this spring semester, more than any others, that really taught me how to prioritize and think ahead when it came to my schoolwork. I knew that when I was travelling outside of Sevilla that I wouldn’t want to drag my schoolwork with me, so even if I wanted to go out while I was in the city I thought ahead to make sure I didn’t put everything off to the last minute and then feel stressed out. I didn’t want to regret any of the great experiences I was sure to have abroad because I was feeling worried about getting all of my work done. While I don’t have anything as exciting on the calendar this semester as trips to cities such as San Sebastián, Prague, and Barcelona like I did last semester, I know that as a senior there are going to be a lot of opportunities for fun events, probably every weekend. I know I am going to have to prioritize so that I can have a ton of fun this semester but still maintain my grades and do well in my classes. Thanks to my semester in Spain I’ve learned to balance without adding extra stress. 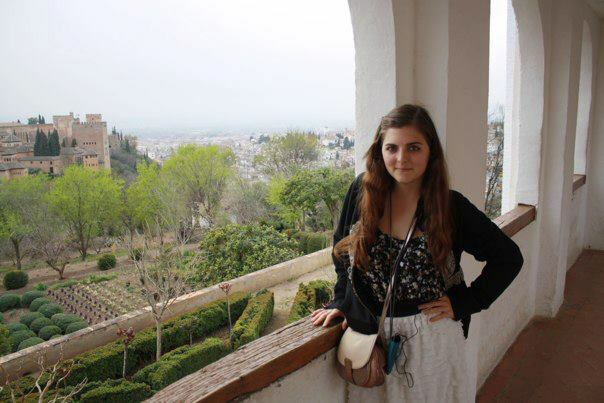 Studying abroad in Sevilla was one of the best experiences of my college career and of my life. I learned so much about finding balance and not being afraid to be perfectly imperfect, and I know I will carry those lessons with me through my senior year and beyond! This entry was posted in Lauren's Lounge, Perfectly Imperfect, Rx for School Stress, Work/Life Balance and tagged Campus Calm, college career, confident, Lauren Mateer, Lead Her Intern, perfectly imperfect, prioritize, senior year, stress, stressed out, studying abroad, work/life balance. Bookmark the permalink.